Transform your smartphone into a speed camera detector and speedometer. Many countries declared war to speeding motorists with expensive fines and speed controls on every corner. Safety cameras, red light cameras, mobile speed cameras - you name it, they've got it. That's why many people tend to spend a lot of money for speed camera detectors. But why waste money when there is a much cheaper, elegant solution? 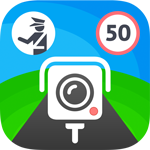 Speed Cameras is a free mobile app from Sygic that uses GPS to warn drivers about speed cameras' locations on their way. It has a robust database which is updated on a daily basis. The database consists of more than 60 000 fixed speed cameras, red light cameras and average speed checks all over the world. On top of that, the community reports tens of thousands of additional mobile speed cameras and police checks every day. Just in the UK there are more than 2 500 mobile speed camera locations reported daily. Sygic Speed Cameras app has a lot of additional features to make your drive even smoother and safer. The Head-up display allows you to project high-contrast optimized interface on your car's windshield by simply putting the phone on the dashboard. The Trip Log allows you to track your driving history so you can get a good overview about your driving behavior. The beautifully designed GPS speedometer is even more precise than the one on your dashboard. Last but not least, the app allows you to join the community and report any speed controls and police checks that haven't been spotted yet. And the best part is that all of this is free! But that’s still not everything this app has to offer. To increase your safety and convenience, you can purchase the Premium version to get voice alerts, speed limits and safety warnings. Turn your phone into a reliable speed camera detector and join thousands of cautious drivers all over the world. Download Sygic Speed Cameras on Google Play or App Store.